Allen Walker is a human from the original D.Gray-man canon. Note: This and the following section mixes material from the series canon as well as from personal canon, and also contains spoilers for D.Gray-man. Allen was abandoned at a very young age by his birth parents, due to the "deformity" of his left arm. Not long after being abandoned, Allen was picked up by a traveling circus, where he spent several years of his life working. Around that time, a traveling clown named Mana Walker joined the circus temporarily. He befriended Allen, who was painfully quiet and shy due to being abused by the workers at the circus.Mana adopted Allen, and both of them traveled together until Allen was 12, when Mana fell sick and died. Allen was torn apart by grief as the only person he had ever considered family died. Soon afer, while visiting Mana's grave, Allen was approached by a person called the Millenium Earl, who offered to bring Mana back to life. All Allen had to do was call Mana's name, and the Earl would call his soul back from the other side. Allen readily agreed, desperate to have his family back. The Earl did as he said he would, and called Mana's soul back, but the Earl trapped his soul in a robotic puppet. Mana cursed Allen for trapping his soul and making him a puppet of the Earl, and when the Earl ordered Mana to kill Allen, Mana carved a curse into his left eye, damning him to see the souls inside of the akuma such as himself. However, being attacked by the now-akuma Mana caused Allen's left arm to activate by itself, and transform into a giant white claw. As much as Allen tried to control it, his left arm destroyed Mana. The shock of being forced to kill his father made Allen's hair turn pure white. 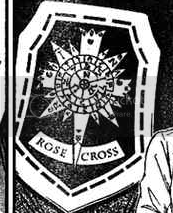 Not long after, Allen was found on the street by a man named Cross Marian, a General for the Black Order. The Black Order was a secret organization that was a sub-unit of the Vatican and under direct orders from the Pope himself. For the next three years, Allen traveled all over the world with General Cross. However, Cross was a horrid man, treating Allen like dirt and leaving him to pay for his tabs while he skipped to the next town for his next chance to score some women and expensive food and wine. Allen was often beaten up and forced into hard manual labor to pay for Cross's debts, and soon had to resort to gambling to hustle some easy money out of people. It took several months and beatings for Allen to perfect his cheating, but Allen managed to make it easier upon himself to pay back his master's debts. After three years, Cross told Allen to take his golem, Timcampy, and head to the Black Order Headquarters to continue his training. He beat Allen unconscious with a wooden hammer, so Allen couldn't tell anyone where he had gone to, and when Allen awoke he began his journey to Headquarters. However, since he had spent most of his time either working or hustling people, Allen had not learned much about his Innocence, not even knowing what it was called until he made it to the Headquarters (and after a brief misunderstanding where his cursed eye made the anti-akuma alarm go off). Cross did not actually teach him anything about his Innocence, instead throwing him into dangerous situations and expecting Allen to get out alive, or die. Once he was welcomed into Headquarters, Allen learned about Innocence, Akuma, and the role of the Millenium Earl. But this took a backseat to the fact that for the first time he could remember, he had friends, and was actually happy for the first time since his father died. Upon joining the Order, Allen began to go out on missions to destroy akuma and collect Innocence. Along the way, Allen picked up a new exorcist ;Miranda Lott, who was stuck in a time warp that rewound one day every night at midnight, forcing her to live the same day over and over for a month. The cause turned out to be a grandfather clock, which contained a fragment of Innocence that can control time. During this mission, Allen encountered a girl of the Noah Clan. As in, Noah of the Great Flood, who grew to hate God, and by extension Innocence and the exorcists. The girl, Road Kamelot, had the power to create dimensions containing anything she wanted. There, she terrorized Miranda and an exorcist named Lenalee Lee until Allen found them and Road shifted her focus on Allen. When Allen realized she is human, she proved herself different from normal humans by attacking herself with Allen's Innocence, only to regenerate in front of his eyes, and stabbed Allen in his cursed eye. When Road moves to kill Miranda, Miranda's Innocence activates, and she is able to 'reverse' Allen and Lenalee's time so they can fight Road. However, Road deciced to torment Allen by ordering an akuma to self-destruct, explaining that if an akuma is destroyed by anything other than Innocence, the soul is unable to be saved. Enraged, Allen tried to attack Road, but Lenalee slapped him to bring him back to his senses. Gleefully, Road took the chance to escape and dumped them back in Miranda's apartment. After healing (though Allen's left eye would be useless for a few more days), Miranda left to travel to the Black Order's Headquarters. Afer that, Allen and a group consisting of the exorcists Lenalee, Lavi, and Lavi's master Bookman, were given the mission to find Allen's old master, General Cross. Allen also picked up Arystar Krory, whose Innocence was contained in his teeth, and had caused him to attack akuma hiding as humans in a nearby town and be branded as a vampire. His Innocence was a parasitic-type like Allen's left arm. Allen is kidnapped by the townspeople, and told his master had traveled through the town a few months back, and had left it up to Allen to travel to Arystar's castle to stop the attacks. There, Allen and Lavi are attacked by Arystar, who had been pushed into attacking them by a woman known as Eliade. Allen is knocked into the castle, and there he learned that Eliade is actually an akuma. He is knocked unconscious by Eliade, by his Innocence continued to attack her. When he awoke, his left eye evolved, allowing him to not only see the souls of akuma, but bring them into reality so others can see them. When Arystar found out, he decided that he would be the one to kill Eliade. Afterwards, he also traveled to Headquarters. Next, Allen is sent to Holland by Headquarters' supervisor, Komui Lee (Lenalee's older brother), to deliver a package to another General by the name of Kevin Yeeger. However, he learns General Yeegar has left for Belgium to investigate a possible Innocence phenomenon. Allen delivered the package and left, but soon afterwards General Yeegar is attacked by a hoard of akuma and two Noah: Road Kamelot and Tyki Mikk. Yeegar is eventually defeated, and crucified by the Noah. He died soon after being found. Tyki Mikk and Allen met up soon enough. When trying to save an exorcist named Suman Dark from becoming a Fallen, an exorcist that has gone against their Innocence and run from a fight, Tyki's butterfly golem 'Tease' ate Suman from the inside out. Devastated, Allen attempted to attack Tyki, but Tyki's ability to choose what he can touch made it hard for Allen to attack him, especially when Tyki used his Tease to rip a hole in Allen's heart, and finally Tyki ripped off Allen's left arm and destroyed it, reducing his Innocence to dust. Allen ordered Timcampy to take Suman's Innocence and escape, and later Timcampy led Lenalee and Lavi to the bamboo forest where Allen was last located. However, by the time they get there, Allen is gone. Lenalee and Lavi returned to the ship that would take them to Edo, Japan, where General Cross is said to be headed. There, a man named Wong from the Asia Branch of the Black Order told them that they found Allen, but implied that Allen was dead. Distraught, Lenalee, Lavi, Bookman, Arystar, and Miranda boarded the ship that would take them to Edo. Back in the Asia Branch, Allen awoke to find that his Innocence had repaired the hole in his heart, and followed him as a cloud of particles. While his friends traveled to Edo, being attacked along the way by a powerful Level 3 akuma, Allen worked tirelessly to re-synchronize with his Innocence. However, Tyki Mikk found out that he was still alive, and sent a Level 3 and his Tease to kill Allen. His Innocence still didn't activate, even with this threat, until Allen realized that he fought for both the sake of humans and akuma. When he attacked the Level 3, he stated that his left arm is for the akuma, and his right arm for the humans, and destroyed the Level 3 after being told about the Noah, the Millenium Earl, and the akuma gathering at Edo. After everything is set, Allen boarded Noah's Ark and traveled to Edo. There, Allen joined the battle just in time to save Lenalee from the Millenium Earl, who was interested in her Innocence (which seemed to have a mind of it's own; while it would not synchronize with Lenalee, it would form into a crystalline form to protect her from attack). With the Earl were two Noah: Tyki Mikk and Skin Boric. The exorcists fought them off, but Lenalee is kidnapped and pulled into the Ark. While trying to save her, Allen, Lavi, Arystar Krory, an exorcist named Kanda Yu, and Chaoji, the only surviving crew member of the ship that brought the exorcists to Edo, were pulled in with her. Trapped within the Ark, the only way out before it was destroyed was through Road's Door, which could bypass dimensions. To do that, they were given Road's key, and had to fight their way to the top room of the Ark before it was 'downloaded' into a new Ark. Fighting their way to the top room was a tragic tale. Kanda stayed behind in the first room to fight Skin Boric, but the room was destroyed before he could make it out. Krory stayed behind in the next room to fight the Noah Jasdavi, but the same happened to him. When they got to the top room, Lavi was trapped in his heart by Road, while Lenalee and Chaoji were held captive so Allen could fight Tyki without interruptions. During the fight, Allen's left arm gained a second form: a large sword that was as tall and wide as Allen that had the power to exorcise the Noah from the Noah Clan. However, when he did this to Tyki, he caused Tyki's Noah to consume him, and Road's Door, their only way out, was destroyed in the process. However, General Cross appeared and saved them from Tyki. In turn, the Earl appeared and took Tyki out of the Ark, leaving the exorcists behind. However, in the process, Lavi and Chaoji were lost in the crumbling Ark. Cross took Lenalee and Allen to a room in the Ark that contained the Earl's Akuma Plant. With the download having reached the final stage, Cross used his magic to stop the Egg from being downloaded to the new Ark, and sent Allen to a secret room that not even the Earl was aware of. It was a sterile white room, with sparse white furniture and a white piano. This piano, as Cross explained, was the Key to the Ark, and that Allen was the only one who could stop the download. Timcampy contained the music - which was written in strange markings that exist in no language, but that Allen recognized - and Allen was urged by his reflection in a window, that took the form of a silhouette wearing a white coat. Even though he had never so much as touched a piano before, was able to perfectly play the melody of the 14th Noah, a Noah that had betrayed the Earl, and in turn was killed by him. The download stopped, and Allen prevented the Earl from getting his Akuma Plant. And as an added bonus, all the people that had been swallowed by the Ark returned as they were when they were taken. Allen, now able to control the Ark, took the Ark to Headquarters. However, he was put under supervision by a man named Howard Link from Central Administration, who wanted to know his connection to the 14th. However, Allen continued to see the white-coated silhouette that he had seen in the Ark, but as a second person next to his own reflection instead of as his actual reflection. The Science Division had started to research the Akuma Plant Egg when another Noah, the shapeshifter Lulubell, infiltrated Headquarters with the intent to take back the Egg. She blocked off the Lab where the Egg was with a Gate from the new Ark, and hundreds of Level 3 akuma came to hold off Allen and Bookman when they used the old Ark to enter the lab. However, beings known as Skulls that had guarded the Egg before almost all of them were destroyed by Cross had come with them, and were turning the science division into Skulls (but only if they had the 'right type of mind', otherwise they were killed). Miranda came through to use her Innocence to stop the Egg from being taken until it could be destroyed, and with all the Generals gathered to fight, the akuma and Lulubell were easily driven off and the Egg was destroyed. However, one remaining giant akuma attacked some of the science division members, and the powerful Level 4 was born. It's soul was, presumably, an amalgation of many souls (it is never shown explicitly, but Allen's horror at the sight of its soul is enough to know how tragic it must be). Allen tried to destroy it before it awoke, but it was too strong, and once it awoke all it took was a flick from its fingers to incapacitate Allen. It attacked the remaining exorcists and Generals, and then moved into the Headquarters. There, it destroyed anyone and anything, but took special interest in Supervisor Komui. Far off in another part of Headquarters, someone else from Central Administration, Lvellier, convinced Lenalee to head to Hevlaska in an attempt to re-synchronize with her Innocence, which had stopped working for Lenalee before she arrived in Edo. Lenalee, wanting to help out as much as she could, decided to go and have the Innocence forcibly equipped. However, Komui had decided to lead the Level 4 away so the rest of the base could evacuate, and ran to Hevlaska, the guardian of the Innocence, with the intention to take the Innocence with him when he fled Headquarters. However, before he could do that, the Level 4 attacked him. Lenalee showed up not long after, and Hevlaska was attacked before the Innocence could be equipped. Lenalee tried to reach her Innocence, but before she could do that Allen appeared and attacked the Level 4. In reality, though, Allen had fallen unconscious due to his serious injuries, and was being controlled by his Innocence. While Allen fought, Lenalee finally managed to convince her Innocence to let her equip it again. The cube of Innocence melted, and Lenalee swallowed it. Allen, Lavi, and Kanda triple-teamed the Level 4, but it was still not enough to even so much as make it flinch. Just as the Level 4 was preparing to kill Allen, Lenalee re-synchronized with her Innocence and attacked. Both Allen and Lenalee attacked the Level 4, and eventually managed to force it to the ground, where Allen pinned it to the ground with his sword. Lenalee forced the sword deeper into the Level 4 by landing precisely on the hilt, twice. General Cross reappeared, alive and well. Everything seemed fine, as everyone who had been around the Level 4 when it awoke was alive, if injured. However, the Level 4 was still alive, and madder than hell. It attacked Allen and Lenalee, but Cross attacked the Level 4, shooting it with his Innocence before it even realized what had happened. The Level 4 tried to escape, but Allen used his Innocence to grab it before it could escape, and both he and Lenalee managed to destroy it. From there, Central Headquarters began to pick up the pieces and mourn their dead. Not long after the Level 4 incident, Headquarters was given the order to use the Ark to move to a new location due to the amount of destruction the attack had caused. However, in the middle of moving the science department (which de-aged Lavi and Kanda, made Bookman's hair into bunny ears, and made Allen's hair grow to mid-back), a blackout occurred. The Head Nurse came out of the infirmary…and bit Allen on the arm. She also bit Miranda, which started a chain reaction of zombie-like behavior (and more biting). Allen, Kanda, Lenalee, Lavi, Bookman, and some of the science department managed to escape. They found Supervisor Komui, who admitted it was due to a virus he created that was spread through the bites. He could make an antivirus, but they needed to find the source. In the midst of it, though, they were attacked by the Generals - sans Cross - who had all been infected as well. The group was separated, and Komui, Lenalee, and two science department members found out a ghost who had died during an experiment was responsible, and was trying to stop them from leaving so it wouldn't be alone. The ghost had even forgotten it's own name, and when Komui was the only one uninfected, he listed off 62 names of people who had been experimented on in the last 100 years. The ghost stopped, but it was too late, and they were all infected. The next day, Asia Branch's supervisor came and made the vaccine. After that fiasco, Allen and some others traveled to the new Headquarters to set up some Gates so they use the Ark to move. However, after he had opened the Gates, Allen's left arm was bound and he was led away by Lvellier. His arms were bound together with some seals, and he was led to General Cross. There, Cross told Allen that Mana and the "14th" were brothers, and the 14th had implanted his memories into Allen so that the 14th could be revived. But in return, "Allen" would be erased, and he would be replaced by the "14th". There time up, Cross left Allen with the warning that he would have to kill someone he loved when he became the 14th. Unsatisfied with that, Allen used Timcampy as a projectile to stop Cross, and said that he would never break his promise to Mana - that he would never stop moving forward - and that he didn't care about the 14th. That night, General Cross was attacked. Soon after he was found, his body was taken. "That was the last anyone saw of Cross Marian." The next day, Timcampy ran off, and while searching for him, Allen came upon the crime scene. Not long after Komui had to announce that Allen was needed at the "Player" who could control the Ark. When Komui couldn't bring himself to say it, Allen asked the exorcists to kill him if he turned into the 14th and tried to hurt anyone. Soon after returning from a mission, Allen came to the room where Cross had been attacked (where all that was left was his broken half-mask and a large blood splatter on the broken window), in search of Timcampy. There, he found Lvellier sitting and enjoying a cake. Both passively-agressively accused each other of being suspicious. Allen appeared in the Digital World in late September. While he initially had trouble with the D-Reader and D-Comm due to his illiteracy, the language soon changed over to the language he had made up with his adoptive father. Dubbing Gazimon "Pierrot" - saying that Gazimon was funny looking - Allen was happy with being in the forest…until he couldn't stand not eating as much as he wanted. He headed towards Royal Base, and ran into the floating fish Dory. While Allen is usually very pleasant, he has a vicious streak that rears its head around rude and obnoxious people.